Please note that we are back indoors starting from next Wednesday (4th October). The start time is now 7.30. Please be there no later than 7.15. Nothing has changed with regards to passes etc, we are still meeting in the guardroom. We will be selling a football scratch card, if you’ve got any spare change, bring it along. It might be your lucky night. Our night out is fast approaching, it’s on the Saturday the 21st October. 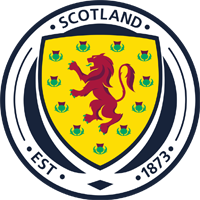 We are meeting at the Arbroath train station at 7.00pm to catch the 7.15 train to Dundee. Once again, there is no pressure on anyone, if you can make it, that’s great. If not, don’t worry about it, there will be other nights. 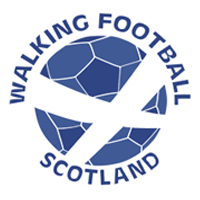 I thought this European Walking Football Competition might be of interest. Open to Teams and Individuals who might want to team up with the ‘Rest of Britain or Europe Teams? The latest details of the Man City – Kingsmaid Walking Football ‘Europa Cup’ tournament to be held at the superb Cambrils Park Sport Village in Salou Spain from Thursday 19th April to Monday 23rd April or Tuesday 24th April 2018. Wednesday night saw the welcome return of long term injury casualty, Jimmy Stewart. Sadly, as one casualty returned, another fell. George Muir limped off after pulling up with what appeared to be a groin strain. We all hope it’s nothing serious and that George is back playing again soon. Once again, the teams picked were fairly even; a nod in the direction of the guys who pick the teams is long overdue, well done chaps. The first half was all about the blue team, goal machine Davie Milne scoring a hat trick. The yellow team had chances, but a combination of bad finishing and the cat like reflexes of keeper Dave Beattie kept the score at 3-0. Afetr the start of the second half, the blue team struggled a bit, gone were the swagger, the cheeky wee flicks and the strutting about with puffed out chests à la Cantona. It could have been the rain, the introduction of the floodlights or the lose of George Muir, or perhaps a combination of them all, but the blue team were in disarray. After they bagged their first goal, the floodgates opened for the yellow team. Notable mentions for Ray Parker, he grabbed his first goal in a while, Mike Burnett for two cracking goals from difficult angles, and Dave Whitton for a great hat trick. Well played to everyone in what was a very enjoyable game to be involved in. 77 year old George Muir showing a cool head to finish off a great move that started from the goalkeeper. The combined age of the Blue team was circa 350. Thanks to Mike Burnett for the footage. Great game of football tonight, well done to all involved. Two very evenly matched teams produced some great passing football. This was the second week of no conatct and it went quite well. We will be investing in some football scratch cards to bolster the club funds, if you can help out with the selling of these, that would be fantastic. Any other suggestions for fund raising ideas are more than welcome. We will be having an end of season night out in Dundee at John’s place (Beat Generator) It’s a great venue, not far from the bus stop and train station. Best part is, we are getting in for nowt. 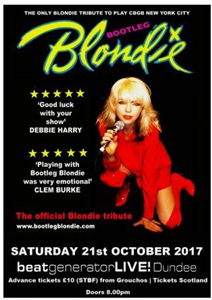 We have a couple of choices, friday the 27th Oct to see Roxy magic – or Saturday the 21st Oct to see Blondie, both are definitely worth seeing. 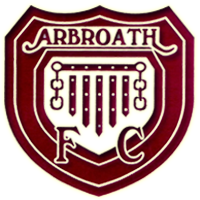 It’s also planned to have a second night out in Arbroath, this will be for the trophy presentations etc. The venue and date have yet to be decided. I had a video sent to me From Dave Milne, it’s about the pre game warm up. Worth having a look, especially if you’re prone to those recurring niggling injuries.